The commemoration of the Easter Rising centenary in 2016 posed the key question of whether – leaving aside the revolutionary decade (1913-1923) – it was appropriate to talk about a “revolutionary Ireland”. The revolutionary decade brought about a change of governance and led to Ireland’s independence, but the new Irish Free State fell short of the proclaimed intentions of the imagined republic. The new state veered away from the influence of labour and socialism to become an institutional replica, and a staunchly socially conservative one, of the British system. It was only from the 1960s onwards that Irish society started to open itself up to more liberating social practices and patterns. This volume offers entirely new work which highlights the historical moments at which it would be possible to talk about a political or social revolution in Ireland, while also considering that in the years when Ireland became “the Celtic Tiger”, certain social involutions took place. The contributors include independent researchers who write about their topics within a theoretically informed, scholarly, framework. Yet it is precisely their independence from academia that provides their chapters with fresh and multidisciplinary perspectives. Others are well established scholars. It is precisely the wealth of approaches and of disciplines (history, sociology, film studies and literary studies) that enriches the volume and broadens the scope. 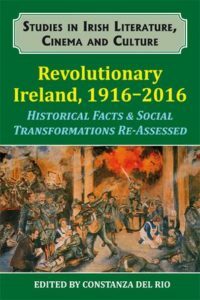 This volume discusses the idea of revolution in Ireland from a multi- and inter-disciplinary perspective. It covers, on the one hand, the political revolution, mainly the Easter Rising 1916, and on the other the social transformations that the country underwent following the claims for civil rights and the sexual revolution of the late 1960s both in the USA and Europe. Changes in Northern Ireland resulting from the cease fire declaration of the IRA in 1994 are also examined. The kind of state – its conservative political regime and social configuration – that emerged after independence points towards the potentially oxymoronic nature of the phrase “revolutionary Ireland.” Yet Ireland’s European location has made the country easily permeable to external influences. These, when allied with Ireland’s process of modernisation, managed to rupture social strictures. Yet, while patterns in religious practice, gender roles and sexuality have inexorably moved towards much more liberal standards, during the decade known as “Celtic Tiger Ireland” the country experienced an involutionary process as regards racism and discrimination against emigrants and asylum seekers. These studies approach the Easter Rising and the revolutionary period from different perspectives and methodologies: archival research, oral history, postcolonial analysis of documentaries on the Easter Rising, critical discourse analysis of witness statements and research into gendered violence in the Easter Rising aftermath. From this history-based section, the volume shifts to social and cultural issues mainly as refracted and articulated through literature and film: the ground breaking literary work of Edna O’Brien, the shifting grounds for masculinity in Roddy Doyle’s The Van, the radical changes in cinematic representations of the Northern Troubles following the IRA’s cease fire, Evelyn Conlon’s vindication of women’s historical voices and presence, and research into Direct Provision Centres. The volume ends with an interview to political activist and page and performer poet Sarah Clancy and the inclusion of two unpublished poems by her. The editor, Constanza del Río is Senior Lecturer in Irish and British literature at the University of Zaragoza, Spain. Her research centres on the contemporary Irish novel and on critical theory. She has written and published articles on Flann O’Brien, William Trevor, Jennifer Johnston, Patrick McCabe, Kate O’Riordan, Eilís Ní Dhuibhne, Sebastian Barry and Seamus Deane. She has been working within the field of Trauma Studies and is now moving into Affect Theory. She has been commissioned to write a chapter for the forthcoming Oxford Handbook of Modern Irish Fiction on the contemporary Irish novel and Trauma Studies. She is co-editor of Memory, Imagination and Desire in Contemporary Anglo-American Literature and Film (Heidelberg: Universitätsverlag Winter, 2004) and of Traumatic Memory and the Ethical, Political and Transhistorical Functions of Literature (London and New York: Palgrave Macmillan, 2017). For more information about the contents of the book, click here.